Many blog readers prefer to receive updates of new posts by email (rather than subscribing in an RSS feed reader). To make it even easier for our readers to stay in touch with our sites, the Blogger Team have developed a new, official gadget: Follow by Email. Using Feedburner technology, this new gadget offers a one-click solution for adding an email subscription form to our Blogger-powered blogs. We don't even need to sign up with Feedburner or visit the Feedburner dashboard to configure this for use in our sites! To begin using this new gadget, go to Design>Page Elements in your Blogger dashboard and click "Add a Gadget" in the section where you'd like the email form to appear. 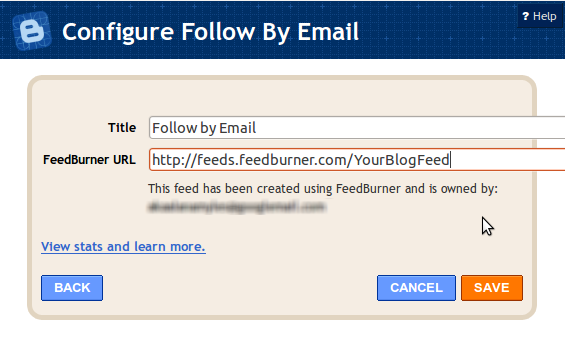 When setting up the Follow by Email gadget for the first time, a Feedburner Feed URL is created for you. Usually this is based on the name of your blog (so long as this feed name is not already in use). This appearance should blend with your existing colour scheme and other gadgets in our blog in the same manner as other Basic gadgets. What do you think of the Follow by Email Gadget? Will you be using this new gadget to encourage readers to subscribe by email? Do you prefer this to Feedburner's original email subscription widgets? Please feel free to leave your comments and opinions below.